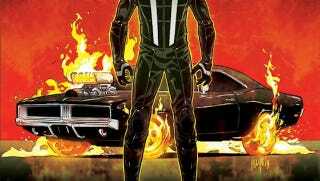 When Ghost Rider drives back into comic stores next year, he won't be doing it on his iconic bike. Now the skull-headed purveyor of vengeance drives a classic Dodge Charger — don't worry, the wheels are still on fire. "Our All-New Ghost Rider, as the title suggests, is an absolutely new character: Robbie Reyes. Robbie's an East Los Angeles high school senior with a short fuse and a passion for electronic music and absolutely anything powered by an engine. In comparison to previous Ghost Riders, he's young and inexperienced in life; but his harsh inner city upbringing, overall distrust for most people, and serious contempt for his violent surroundings make him the perfect host for a Spirit of Vengeance." I have zero problems with this.